This tutorial explains why WordPress is free and looks at the basic costs involved in setting up and running a WordPress-powered website or blog. There are many great reasons to choose WordPress to power your website (see our Introduction To WordPress tutorials). 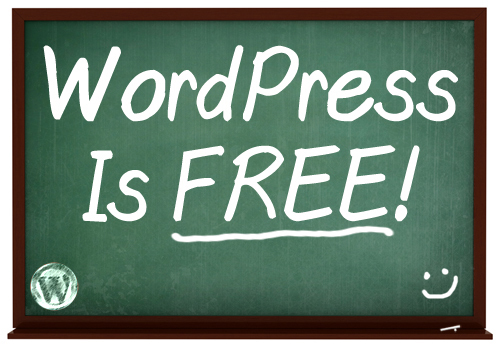 Something that puzzles many people, however, is the concept of WordPress being “FREE”. How much does it “really” cost to set up and run a WordPress site? How does WordPress make any money? Let’s start by looking at why WordPress is free and the costs involved in running a WordPress-powered website. WordPress is “free” not just in terms of price, but also in terms of the amount of control you have over using it. For example, you have the freedom to run the program, for any purpose, the freedom to study how the program works, and change it to make it do what you wish, the freedom to redistribute the application, and the freedom to distribute copies of your modified versions to others. When discussing software, and in particular open source software, it’s useful to first understand that “free” can have different meanings and to be clear what software developers mean when they say that their software is “free”. There is “free” as in freedom (e.g. freedom of speech), and “free” as in free money and free beer. WordPress is an open source software, so this sense of freedom applies to it. However, and this can be quite shocking to some people, WordPress is also completely free in the sense of “free beer”. WordPress is 100% free to download and use for commercial purposes. 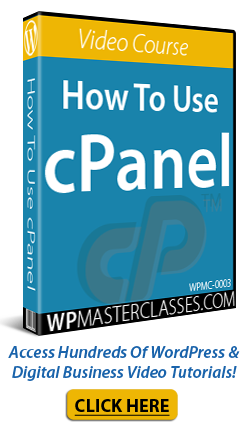 This means that you can download the complete software, install it on your domain, and build a wildly successful and highly profitable website or blog using WordPress, without ever paying the developers who created WordPress any software licensing fees, or experiencing any limitations or restrictions. And, just in case you are wondering, there is no “free” version with hidden advertising banners, or 30-day expiry notices either. With WordPress, “free really means free”. You can download and use the full WordPress software, change the code and customize the software however you like, and you will never pay for using the WordPress software. It is truly a “free” open source software. Now that we have hopefully made this point absolutely clear (WordPress is Free!) … does this mean that there are no costs involved in building a successful web presence using WordPress? Absolutely not! 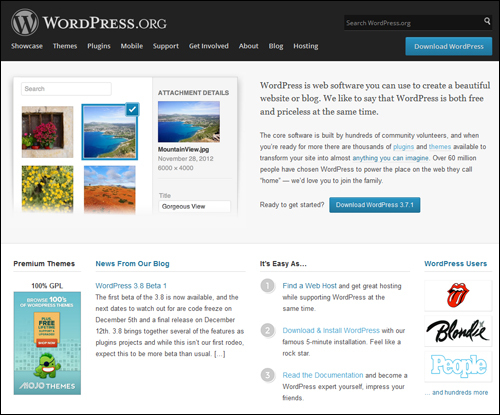 You can download and use the WordPress software for free. You can also enhance your site’s functionality and design using thousands of free add-ons (called WordPress plugins), and free web design templates (called WordPress themes), and we explain this in other articles and our tutorials. 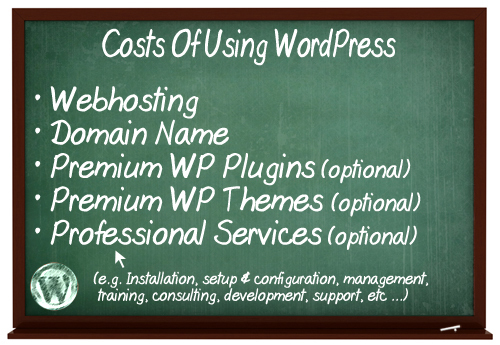 There are, however, some costs involved with using WordPress. As you will soon learn, these costs are perfectly reasonable and they are not hidden at all from you. We’ve already established that WordPress is open source software and that the WordPress software is free to download and use commercially without any restrictions. Now … there are costs involved with using WordPress, but most of these have to do with the normal costs of doing business on the web. To install and use WordPress on your own domain, you will need a domain and webhosting. This is no different than if you were to set up any other website on your own domain name. The good news is that the cost of registering a domain name and setting up a web hosting account are minimal. For example, you can get a domain name from GoDaddy for around $10-$12 per year and web hosting for a WordPress site from Hostgator for around less than $5 per month. WordPress offers an option to create a free hosted blog on its servers at WordPress.com, but we recommend downloading the self-hosted version from WordPress.org and installing WordPress on your own domain, especially if you own a business. Installing WordPress on your domain allows you to build an asset that you own and fully control. You also have more options on how to configure and customize your site if you use the self-hosted version of WordPress. The only real cost associated with learning WordPress is time. You can learn everything about WordPress, including how to install, set up, configure, use, customize, manage, optimize, secure and grow a WordPress site with our detailed WordPress step-by-step tutorials and get additional help from the WordPress community user support forums and various WordPress online groups. You can learn how to install, configure and manage a website built with WordPress yourself using our tutorials, or pay someone like a website developer to install and set up a website for you. If you plan to pay someone else to build your website, check out our list of 7 questions you should ask your website developer and make sure you use our WordPress Configuration Checklist when asking for quotes. After your WordPress site has been installed and configured, all other costs are optional. You can extend your site’s functionality and improve your web design using free WordPress plugins and free WordPress themes. If you can’t find a free plugin or theme that suits your needs, or don’t want to use free plugins or themes, there are many commercial (“premium”) WordPress plugins and themes available. These plugins and themes cost money, but the cost to purchase these is relatively small. For example, many “premium” plugins and themes only cost around US$30 – US$100 to purchase. The benefits of using “premium” plugins and themes is that you not only get greater functionality, more customizable options and exclusive designs, but more importantly, access to product support. If you need help with WordPress, your first step should be to check out our comprehensive library of WordPress step-by-step tutorials. Our tutorials are designed to help you quickly and easily master all aspects of using WordPress. Hopefully, now you understand why WordPress is free, and what the costs of running a WordPress-powered site are. Originally published as Why Is WordPress Free? WordPress Costs Explained.